When it comes to customers’ restrooms, it’s important to clean them as thoroughly as possible. But they must smell fresh, too. That’s equally important because offensive restroom odors are more than just unpleasant — they can be the symptom of a larger, health-affecting problem. A restroom that emits a repulsive odor is probably not being serviced enough or has a build-up in the pipes, especially if it’s situated in an old building with old pipes, he says. If people are met with bad odors, visitors will walk away with an unfavorable image of the facility, states Larry Faust, owner of Clean Way Maintenance Service, Brownsburg, Ind. “If they are employees, they’ll complain about it. Those two possibilities can be avoided if the restroom cleaning job is done right,” he suggests. A bad image isn’t the only result of bad restroom odors. Even more significantly, health can be affected, too, says Mansour Zarinkia, vice president-operations for Modern Maintenance Inc., Lenexa, Kan.
To do the job effectively, Faust believes BSCs should combine their knowledge, skill and hard work with the right products and procedures. Doing this correctly, he says, eliminates the twin specters of restroom odors and unsightly restroom fixtures. To ensure a clean smelling restroom, first you have to identify the source of the odor problem, explains Zarinkia, “It’s a good idea to observe what’s currently being done to clean the restroom. Go into that restroom at different times of the day to see if there are any variations in the odor. Determine if the cleaning staff is only using water. Determine if they are being thorough in their cleaning,” he says. According to Zarinkia, restroom odors can come from many sources, including the natural odors emanating from the humans using them. “Offensive odors can also originate from dirt and bacteria. Sometimes dry drain traps allow sewer odors to enter restrooms. Leaking pipes behind walls can ferment mold,” Zarinkia says. Inadequate ventilation, too, can also be a source of odor, he points out. Too much moisture in the air promotes microorganism growth and poor ventilation can create an odor problem. BSCs should check and monitor drains and pipes because they are a well-known source of fostering odors, Germyn advises. “Make sure pipe traps are filled with the proper amount of water for disinfection. Urinals and floor drains have U-pipes in them and if the water evaporates out and the pipes are old, there will definitely be an odor. Putting a disinfectant down those traps will eliminate a lot of odor,” he says. The first step to keeping odors under control is to thoroughly clean and disinfect restroom surfaces, Faust says. Pouring enzymes in drains can break down materials that are decaying and causing problem odors. Proper cleaning should remove not only the dirt you can see, but also the dirt that’s in places that catch the materials and bacteria that can lead to offensive smells, he says. Use a quat (quaternary ammonium compound) product when cleaning floors, urinals, toilets and the partitions between stalls, recommends Germyn. Cleaning a restroom once daily isn’t adequate, says Germyn. “In some cases, if you can, you need to get in there three or four times a day to do the job,” he says. Jan/san industry manufacturers provide a wide range of products to combat odors. 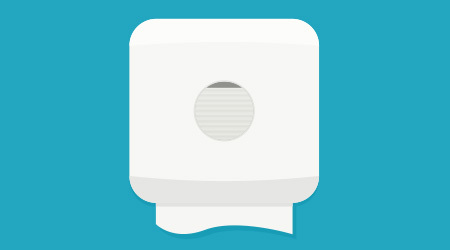 These include urinal screens, cakes and mats; air fresheners; cleaning chemicals; commode mats, and air sanitizers. Disposable paper towels, mops and mop buckets, and toilet brushes are also important products to use in the battle against odors. No one likes smelling offensive odors, whether it’s janitors or building tenants. Using the proper products and procedures will have everyone breathing fresh air and eliminate dangerous health threats from the environment. A BSC that is successful in achieving and maintaining clean and fresh smelling restrooms for customers will enhance a company’s reputation and its revenues. Jordan Fox is a freelance writer based in Milwaukee.